RMS Titanic was a British passenger liner that sank in the North Atlantic Ocean on 15 April 1912 after colliding with an iceberg during her maiden voyage from Southampton, England to New York City. The sinking of Titanic caused the deaths of 1,514 people in one of the deadliest peacetime maritime disasters in history. She was the largest ship afloat at the time of her maiden voyage. One of three Olympic class ocean liners operated by the White Star Line, she was built between 1909–11 by the Harland and Wolff shipyard in Belfast. She carried 2,224 people. A crew member of that vessel said to a passenger. Quoted in The Watchtower magazine, published by Jehovah's Witnesses, April 15, 1988. 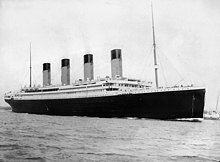 The Titanic sank about 2:20 a.m. April 15, 1912, according to the records. I saw it slide down into the ocean to its horrible finish. The moment it sank left a memory of something that haunts me till this day. It was the eerie sound of the people groaning and screaming frantically for help, as they were hurtled into the icy water. Almost all died from the cold water. The sounds lasted for about 45 minutes and then faded away. Louis Garrett, Titanic survivor. Quoted in Awake! magazine, October 22, 1981. New York Times, April 16, 1912. Great God, man! Open the gate and let the girls through! For God’s sake man, let the girls past to the boats, at least! James "Jim" Farrell to a crew member who was blocking a passageway. Farrell's actions saved the lives of four Irish women by allowing them to reach the lifeboats..
Charles Lightoller after refusing a direct order to enter a lifeboat..
We have lived together for many years. Where you go, I go. Said by Ida Straus to her husband Isidor after she refused to board a lifeboat. Said to have been said by Colonel John Jacob Astor, but for various reasons this attribution is spurious. This page was last edited on 2 January 2019, at 18:28.